Up on the housetop… photographers pause? Home > Photography > Aerial Photography > Up on the housetop… photographers pause? The best thing about having a great business partner is not just that we are diversified in our skill sets and not just that we can shoot people to products or aerials to architecture. Of course, those are all great assets for a modern professional photography studio. 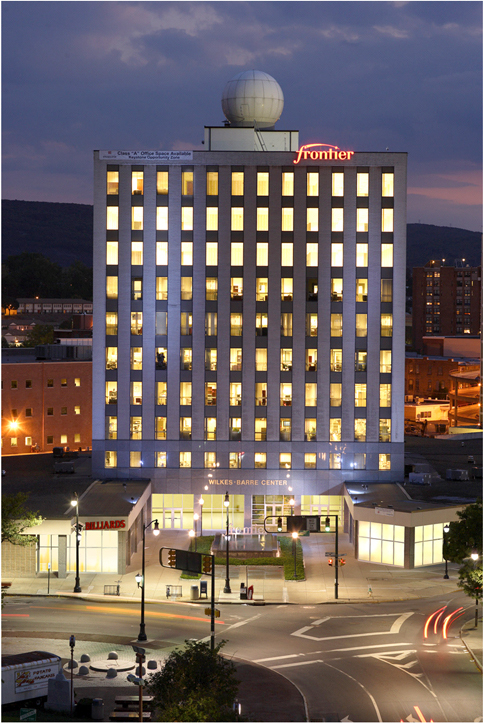 The best part for me is that JB will guilt me into doing things that I normally wouldn’t – like climbing onto a rooftop in downtown Wilkes-Barre to get the perfect image of the Frontier Communications building. AND Although this isn’t the first time JB has guilted me into getting onto a roof, it doesn’t get any easier! I guess JB had a good reason to push me to my limit. He guilted me into going on my first aerial photography flight more than 20 years ago – in a little aluminum tube that weighed less than my car! Long story short…. Now, I do most of the aerial photography(over 350 hours to date) for clients as diverse and race tracks, real estate giants and your average person looking for that perfect gift- a picture of their home. Thanks JB… now, just don’t look down… right?